Why choose Craft CMS instead of WordPress | Codegraph Inc. Recently, even for small to mid sized web projects, it is assumed that a CMS (Content Management System) will be implemented in the buildout process. The delivery of new content, as well as the ability to increase the volume of content, is also vital to SEO concerns. However, another major reason is the lower costs that have been ushered in with the widespread implementation of open source Content Management Systems. Since only a portion of a site is possible to be updated, we have seen cases where the goal of implementing a CMS (in most cases, Wordpress) was for setting up a contact form. As far as CMSs, even though there are rivals such as Drupal and Concrete5, in many cases the simplicity of it’s install, and ease of restructuring, has led many to Wordpress as their default choice. Wordpress was initially developed as a platform for blogs, however, there is an abundance of third party plugins and themes, that allow extension beyond that. It has now become widely used for building business sites, campaign sites, social network services, and e-commerce projects as well. In a November, 2016 announcement by Automattic, the parent company of Wordpress, it was announced that the CMS had acquired a 27.1% share of the market. With many use cases and a large user base, Wordpress is easy to support, whether you are dealing with hosting, external services, or finding developers. Making it an easy choice for many situations. Even our company has used Wordpress in many of the sites that we have created. The majority of those were sites that were equipped with a blog functionality. Nevertheless, for those sites, the blog content was not the main focus, but rather, a side feature for the overall project requirements. For that reason, static pages were used for the display of articles, and used instead of a front page template. Therefore, it was necessary to build out the site in a manner where the top page and blog page(s) were separate. In this manner, Wordpress, which is primarily useful as a blogging platform, has become regularly used for many projects by way of extensive customization. WordPress is completely free to use, and has a firm place amongst open source CMSs. Therefore, it has an enormous community and a wealth of development resources. In most cases, searching Google will turn up an answer to your WordPress related questions. Furthermore, thanks to a large selection of themes and plugins, additional functionality, and customizations are also easy to undertake. The flip side of this, is that as it is open source, it is easy to discover vulnerabilities. As a result, it has a distinction of being popular for hackers to target the system due to the large user base and implementations across the web. Due to this fact, it is imperative to improve the out-of-the-box security settings, constantly perform updates, and keep the base install, as well as plugins updated to the most recent version to reduce security risks. In the absence of proper understanding that this sort of labor and time will be a regular occurrence, clients may feel that the fees for monthly maintenance and support are unexpectedly high. Therefore, if the client’s goal of choosing WordPress is for reducing initial costs, they need to be aware that this will lead to other costs over time. Furthermore, the power and extendability of WordPress found in it’s custom hooks (action hooks & filter hooks), causes the default functionality to be easily utilized for hacking. As a result there is a customization strategy where, WordPress’ core files, plugins, and themes, can all be connected with hooks, which can disallow changes to the core files, and afterwards, allow the addition and removal of functionality. This convenient feature will allow for various requests from clients to be handled, however, over-using it will make non-critical edits (largely design matters), also be assumed to need to make use of this method. The result of this is cases where the source code for templates become complicated, and maintainability is significantly degraded. With the above mentioned background, recently our team has decided to re-evaluate the main tool we use for CMS site development. Accordingly, we would like to introduce an influential contender. Craft CMS is not a major player at the moment, the site CMS Critics designated it with the award for “Best CMS for Developers” in 2015. It is a CMS that is gaining attention and a good reputation. … this is only one example, however, the following points emphasize that this CMS is realizing this concept. Equipped with entry fields that are similar to Wordpress’ Advanced Custom Fields and it’s paid add-on, Flexible Content Fields. Without adding new functionality there are an abundance of fields types that can be added as entry fields. This allows even complicated content creation to be easy to accomplish. Single, Channels, Structures, are the three types of section types that make it possible for flexible site content planning and management possible. There is also no need to labor through the addition of custom post types like is necessary with WordPress. Using divided screens, real time edits can be previewed, allowing you to see how the user facing portion of the site. Confirm the content as you edit. Assets that are classified by use can be managed with this feature. For example, images used in common parts and blog articles, can be managed independently. Therefore, it’s possible to avoid problems that arise when mixing assets. This method is very convenient for content managers. Additionally, fields that configure assets can be freely added and changed. User group creation and permission designation allows for access level control. With Wordpress, it was necessary to use a plugin like the User Role Editor. In Craft CMS a more detailed setting environment is possible. Multi-lingual functionality is a standard feature, making site content localization implementation a breeze to do. Here I will not go into further detail, however, Craft has many other superior characteristics, and customization to core functionality is not needed. So we can easily create a CMS driven site to suit various needs. However, it is not a totally free to use CMS as WordPress is. There are currently three types of licenses. Client projects require a one time license purchase. There is also another tier for sites that need to make use of multisite and, or user groups. However, after considering the above benefits, would you not agree that this is not an unreasonable amount to pay for the license? In your development environment, it is possible to change the license type, allowing you to test all the functionality of the system. So you will be able to consider adding that to your project at a later time. 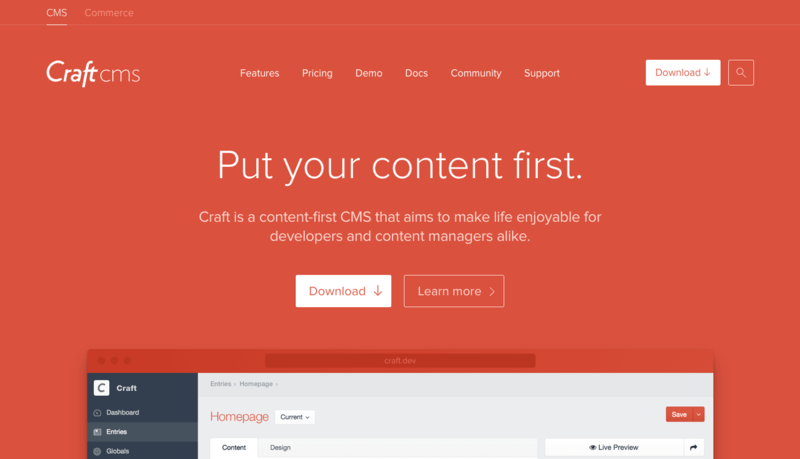 If you have used WordPress as your primary tool for development, please give Craft CMS a try. We are certain that you will also realize that you have overused WordPress. Using Craft CMS will allow you to free yourself from concerns about the core code being hacked, or using the most current plugins. We also are sure that development will become more enjoyable by building with Craft CMS.